No one is a perfect driver all the time, not even me! We all make driving mistakes now and then, but it’s important to constantly drive defensively and do our best to avoid committing traffic violations, no matter how “minor” they might be. But what if we don’t realize we are committing a violation? Let’s take a look at some of the more common infractions people make that often are committed without the driver even realizing it. Some people call it an indicator, others a blinker or turn signal. No matter what you call it, it’s important to use it! A recent study by the Society of Automotive Engineers showed that over 25% of drivers failed to properly use turn signals when turning, and nearly half of drivers failed to signal before changing lanes. This is a serious issue! Indicators are your way to communicate your actions to other drivers so they know that you plan on moving your vehicle into a different lane of traffic. Without that communication, other drivers will assume you will continue the same path, and that can, and does, lead to many vehicle collisions. It’s important to use your indicator at least five seconds before merging into the signaled lane in order to give all vehicles amble time to respond. Any less is not enough warning for other drivers. National law requires all automotive vehicles have operational turn signal devices installed and that drivers use those signals to indicate any lane change or turn. And yes, that goes for turns performed in designated turning lanes, too. Rule of thumb: If you change lanes or turn, use your indicator! Lots of drivers don’t change lanes while driving in the middle of the intersection because they believe it is against the law. Even though this is good practice, as changing lanes mid-intersection can be dangerous, a lot of states don’t consider it an unlawful act. Still, some states, like Ohio, do consider it illegal. Whether your state has a law against changing lanes mid-intersection or not, the action of doing so is still often frowned upon. Intersections are often busy areas. Such areas are often considered unsafe to change lanes in. Even if your state does not have a particular law against changing lanes mid-intersection, it definitely has a law forbidding unsafe lane changes. If a witnessing police officer considers the mid-intersection lane change unsafe, you can be cited for it. Rule of thumb: Don’t change lanes in the middle of an intersection! Day or night, many states lawfully require drivers to keep their headlights on while their windshield wipers are in use. The rain impairs vision and reduces visibility of all drivers, even in the middle of the day. Keeping your headlights on both increases visibility for the person driving the vehicle and makes it easier for other vehicles to spot said driver. Remember, headlights work both ways for increasing visibility. Not every state requires headlights to be on while wipers are in use, but it’s still good practice to do so. Keeping your headlights on while visibility is low, like in rainstorms, is always a good idea since it increases visibility for all drivers. Doing so could save lives. Rule of thumb: If your wipers are on, your headlights should be, too! This is a big problem where I’m from, which is probably why people often call this the “California Stop.” No matter where you drive in the United States, you are required to make a complete stop when you come upon a stop sign. But that’s where there can be some debate--what exactly is a complete stop? First, it’s important to check all ways for moving vehicles, pedestrians, or other possible roadway hazards before entering the intersection. Doing so can take a couple seconds to do. 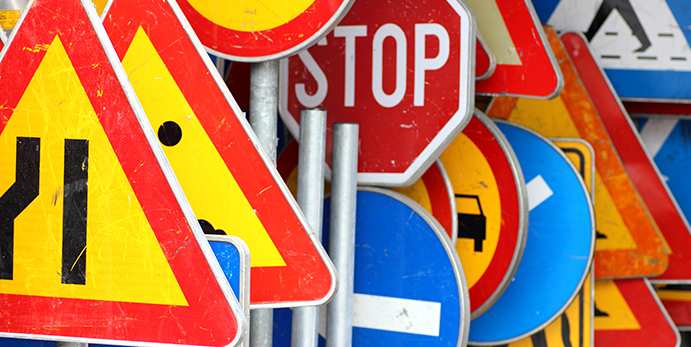 You should remain stopped at the stop sign until you've properly checked all directions and ensured they are clear. Second, the longer you remain stopped, the more discernible it is to other drivers. This means a witnessing police officer will better distinguish a complete stop if you stop for three seconds rather than one second. Doing so could save you the hassle of dealing with a traffic ticket. Speaking of tickets, if you are spotted not making a complete stop at a stop sign, you can, and will, be cited for running that stop sign, regardless if you slowed down or not. Traffic enforcers across the country are really stern about this, and rightfully so. As I stated before, complete stops are necessary to ensure the intersection is clear and safe to continue. It’s not only the law to stop, it’s common sense! Rule of thumb: Stop long enough for your back to hit your seat. This means that there is no more forward momentum from driving, ensuring your vehicle has stopped completely. Allow yourself enough time to check all directions and ensure the intersection is clear before advancing! This is something I see drivers do all the time, a lot of which aren't even aware that there are laws requiring them to move over or slow down while passing an emergency vehicle on the side of the road. As of 2013, all 50 US states have Move Over Laws in effect (the only exception being Washington D.C.). Each state has its own specific rules to the law, but generally all require drivers to move into a farther lane of traffic, if safely able to do so, or slow down while passing. Not doing so can result in a fine, license suspension, and/or jail time. This is a serious law as it protects the men and women working alongside our busy, and often dangerous, roadways. Rule of thumb: Move over or slow down while passing emergency vehicles on side of road! Just because you aren't aware that you are violating a law does not mean you won’t be cited for doing so. Stay vigilant and practice defensive driving at all times, and be sure not to violate any of these common infractions. It’s also a good idea to check in with your local DMV to stay up-to-date on all current laws in your area.